Quacksalver | Leah Palmer Preiss ~ Curious Art: Acrylic painting on text collage on canvas, 6"x6"
Quacksalver Acrylic painting on text collage on canvas, 6"x6"
Today’s A.Word.A.Day painting is Quacksalver, a variant of the more familiar quack. 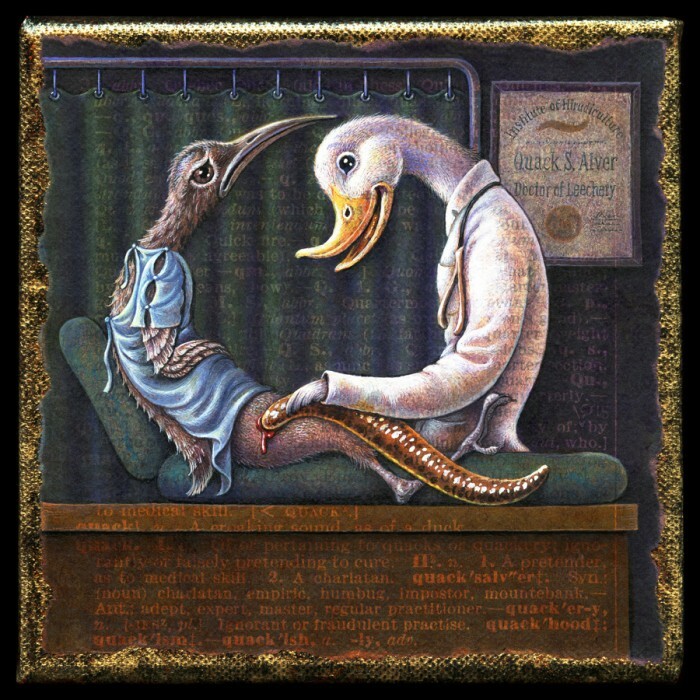 This particular duck doctor is administering a terrifyingly large leech to his very unhappy patient. His office wall bears a dubious diploma from the Institute of Hirudiculture, conferring a degree in leechery. Three troubling vocabulary words for the price of one! This entry was posted in Uncategorized and tagged A Word A Day, Acrylic, Art, Doctor, Leech, Letter Q, Painting, Patient, Quacksalver on 30November 2015 by Leah. Alas, this species is found everywhere!